Birth date and place 7 Aug 1829 St Nicholas, Dublin, Ireland. Civil Census Residences 11 Mitchell’s Court, Whitehaven, Cumberland, England (1861). Physical Description Height: 5 ft. 6 ins. Complexion: fresh. Eyes: grey. Hair: light brown. Marriage date and place 3 Oct 1849 St Peter’s, Athlone, Westmeath, Ireland. Children Mary b. 1851 (d.1862), Dublin, Ireland. Sarah b. 1857, Dublin, Ireland. William Henry b. 1860, Whitehaven, Cumberland, England. Mary Jane b. 1863, Perth, Western Australia. Thomas b. 1865, Perth, Western Australia. Louisa Adelaide b. 1870, Fremantle, Western Australia. 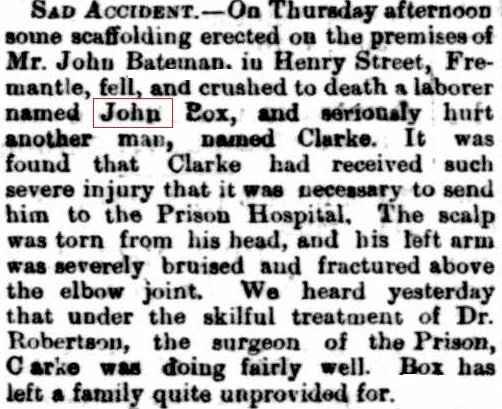 Death date and place 6 Mar 1879, Western Australia [unproven]. Death Notices and Obituaries Inquirer & Commercial News 12 Mar 1879. 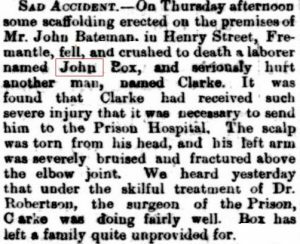 [This may relate to the death of a convict named John Box – see ‘Sad Accident’ in sidebar]. Regiment No. and Rank #2820 (31st Reg). #3138 (57th Regiment). Private. 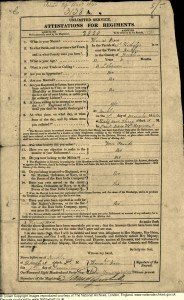 Attestation date and place 7 Dec 1846 Dublin. Service/Campaigns Corfu, Ionian Islands 1 year 7 months. Expeditionary Army in the East (Crimea) 7 months. 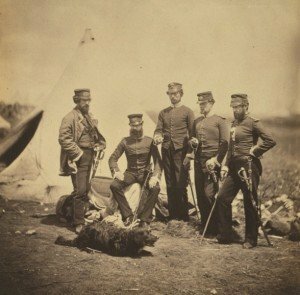 Musters 1851 Dublin, Ireland (31st Regiment) [WO12-4693]. 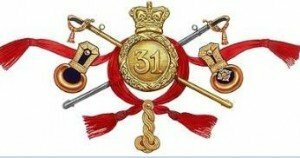 Disabled by constriction of left knee after gunshot wound of thigh he received at Inkerman. Unfit for further service. Discharge date and place 24 Jul 1855, Chatham. Length of Service 7 years 252 days. Post Discharge Pension District 2nd Dublin (1855). Cumberland Militia (1856). 2nd Dublin (Jul 1856). Carlisle (Oct 1857). Pension Amount 8d. per diem. Increased to 1/0½d. per diem 4 Jun 1878 for service EPF. 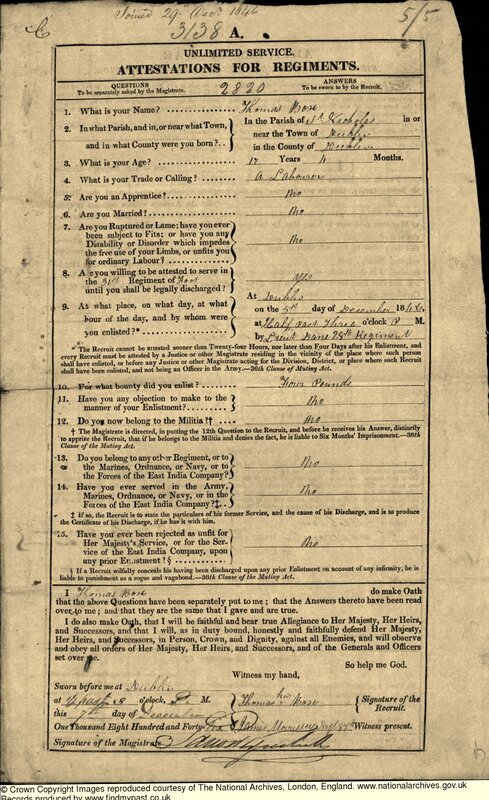 Thomas Box’s record of enlistment. Note the bounty paid. [WO97-1562-48]. 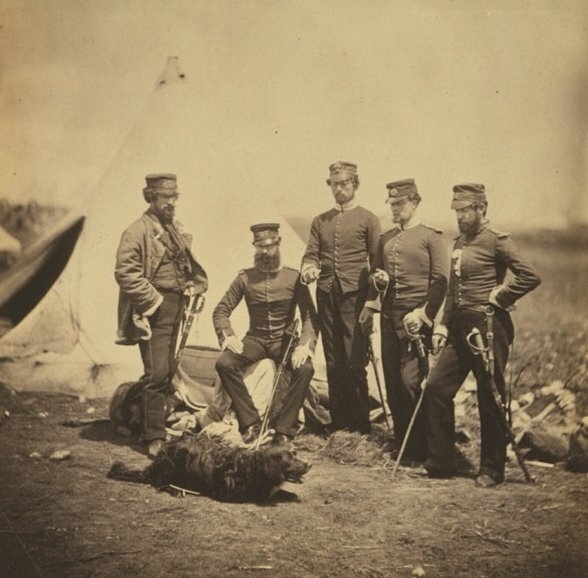 Officers of the 57th West Middlesex Regiment at the Crimea [Roger Fenton].